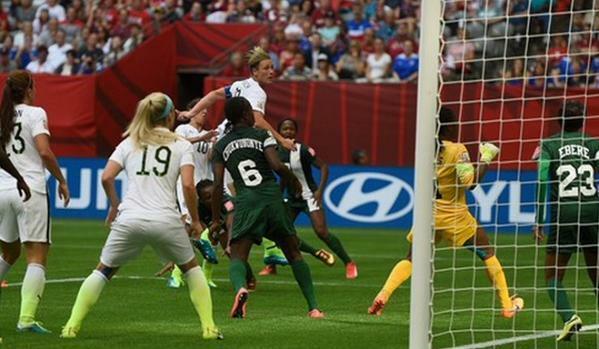 Super Falcons of Nigeria has crashed out of the FIFA Women’s World Cup in Canada. They lost 0-1 to the USA in Vancouver today and finished fourth in the Group D.
‎Abby Wambach scored the only goal of the game just before half time. Efforts by our women’s national team to equalise and even score goals to proceed in the competition proved abortive. They exit the tournament having drawn with Sweden and lost 2-0 to Australia. Super Falcons coach Edwin Okon has blamed match officials for his side’s defeat. Okon,who ignored US coach Jill Ellis’ offer of a handshake after the match told reporters that the officiating was poor. PreviousEmpower yourself to financial fitness| Register for Phunmi Ankara craft’s Ankara Shoes, Bags & Accessories training. Omoni Oboli shares tips on how to boost your child’s appetite.